Mopeding is an awesome way to experience all the park and surrounding county has to offer in enough time to get you to your dinner reservation. Please read through this page to prepare for your ride! RESERVATIONS ARE RECOMMENDED. Each moped is equipped with a full tank of gas and a park sticker. Gear up for a fun and fast ride to Sven’s Bluff, Nicolet beach, Eagle Bluff and if your looking for even more of an adventure, take our back country maps to wind your way through the peninsula to the water front towns that call Door County home. We recommend booking online to guarantee the best options. No booking fees. Even if you are an experienced rider, all riders will be required to wear helmets (provided free with the rental or you can bring your own). We have the right to deny rental if we feel you are not safe. We understand this can be frustrating if it happens to you but your safety is our number one priority! 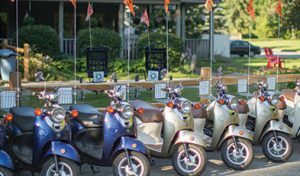 Please review our moped rental policies regarding cancellations, refunds, payment and online reservations here.